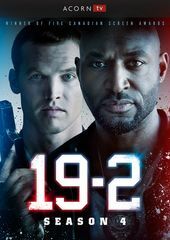 Character-driven drama, 19-2 revolves around the day-to-day life of two unwilling partners of the Montreal Police Department, Officers Nick Barron and Ben Chartier. These two beat cops patrol the urban sprawl of downtown's 19th district, in cruiser No. 2. 19-2 is about the tensions and bonds that develop between two incompatible men of very different temperaments and life experiences.